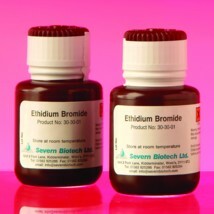 Ethidium Bromide solution is a ready-made solution used for staining agarose and acrylamide gels containing nucleic acids. 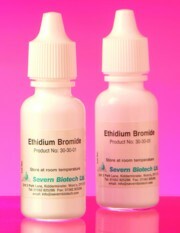 This stock solution has a concentration 10mg/ml in line with most published formulae. It is supplied in an amber bottle to reduce photo bleaching, but can easily be aliquoted into smaller vials to help reduce the possibility of contamination and extend the life of the product. This product is supplied DNase & RNase free.